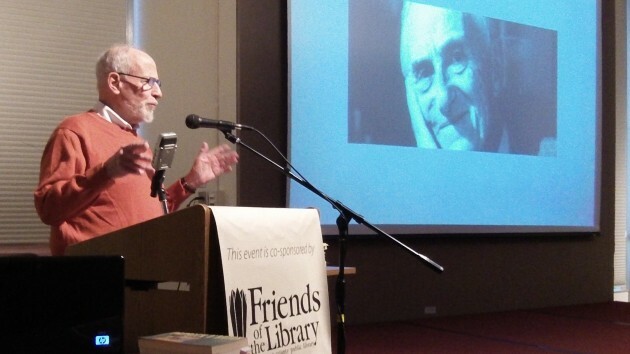 Gerald Krantz talks about Patrick O’Brian as the author’s face appears on the screen. No time could be better spent reading than these rainy days of January, short and gloomy as they are. And there is no better story to take our minds off this entire dispiriting age than the novels that the late Patrick O’Brian created about Jack Aubrey, the British naval officer, his friend Stephen Maturin and their exploits in the wars against Napoleon Bonaparte. The stories take place at sea and on land all over the world. The writing is superb, almost poetic, and the stories are alternately funny and sad, heroic and tragic, often suspenseful, and filled with extraordinarily vivid detail not just of naval warfare in the age of sail but all of life in the early 1800s. For me, the stories reawakened a boyhood interest in the historic struggle against Bonaparte. When I was 8 or 9, I was staying with my grandparents in Leipzig, Germany. They handed me a dime to ride the streetcar, and I took the line way out of town to a towering stone pile, a monument to the Battle of the Nations in 1813, where the combined forces of Russia, Prussia, Austria and Sweden dealt Napoleon’s forces a decisive defeat. The diorama recreating the action in miniature impressed me no end. I wish I would have known about this, I’d have enjoyed hearing Mr. Krantz speak. I’m nearly finished with the 21st, and last, book of the Sharpe’s series of novels (about Wellington’s Army in the ‘Peninsular War’of the Napoleonic War) by Bernard Cornwell. I was weighing the option of starting the Aubrey-Maturin or the Hornblower series when I’m done with Sharpe. Thanks for the recommendation Hasso, I’ll be reading about Lucky Jack’s adventures very soon! Good to hear you enjoy sailing with Aubrey and Maturin. I have read the first 16 so far and am slowing down to savor the last remaining few. I agree that the series is a magnificent body of work, and I love escaping into the past.